The majority of search engines track people that use them. While the amount of tracking differs, from just recording search terms and IP addresses to creating detailed online profiles about searchers, it is fair to say that this can be a privacy issue. Search engines such as DuckDuckGo or StartPage gained popularity in the wake of PRISM as some Internet users were searching for alternatives that would not track their every move and search on the Internet. The two search engines mentioned take the search results from popular engines such as Bing or Google, add their own flavor to it, and display them to users of their service. This means that users get the same level of quality that Bing or Google provide but without the tracking. 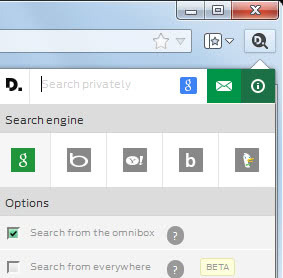 The web browser extension Disconnect Search uses a similar system. It too acts as a proxy that sits between the user's computer and input on the one side, and the search results provided by engines such as Google's or Microsoft's on the other. The extension adds an icon to the browser's toolbar that you can click on to display search and configuration options. You can search right away using any of the five integrated search engines - Google, Bing, Yahoo, Blekko or DuckDuckGo - or configure the search to work in the browser's address bar, or native search forms provided by supported search engines. The first option, to search directly from the address bar, is enabled by default, while the second is not. It is listed as a beta feature but works considerably well if you enable it. It means that you can load one of the supported search engines directly and use the Disconnect Search proxy if you run a search on the loaded site. In short: you visit the search engine, enter your search term, are redirected to the proxy, and get the results displayed to you afterwards. This can be useful if you are used to search using the search engine's website, as you can make use of Disconnect Search even then so that you do not have to change your searching habits at all. Disconnect Search furthermore prevents the sending of search queries to websites that are loaded from the results page, and uses encryption to protect your searches from your ISP or network monitoring programs. What's missing? An option to use custom search engines as your favorite search engine may not be supported by the application, especially if it is a foreign search engine. Firefox users may also be worried that the extension is not hosted on Mozilla's official add-ons repository, but on the Disconnect.me website. The extension seems to be only available for Google Chrome (Opera 15+ may work as well because of that) and Firefox. An Internet Explorer and Opera version is in the making and will be available shortly according to the developers. You do not really need to use Disconnect Me if you are already using a search engine such as StartPage, as it provides you with the same feature set. While you may switch between five different search engines if you install the extension, it is not really something that most users seem to do very often. If your favorite search engine is Google, Bing or Yahoo, then you may benefit from Disconnect Search the most, as you'll improve your privacy doing so. It is recommended to enable the beta option to redirect all searches through the proxy, so that you can search anyway you want and still benefit from the privacy increase. What’s with the trend to keep bloating nice, light, little programs? Currently everyone must add every kind of additional crap, damn it. I do agree that it boils down to trust, but the situation is somewhat different, at least when you take Google, Bing or Yahoo on the one side, and the Disconnect Search extension on the other. All three companies track users on their search engines while Disconnect Search claims it does not. This means that if you use any of the three big ones, you will be tracked. If you use Disconnect Search, there is a chance that you are not. That’s what I had tested, but this option is mentioned as beta for a good reason apparently, since when I unchecked it, it stayed active nevertheless. I’d advise to avoid at this time the beta, or have a backup of your browser data folder ready. Otherwise, works fine except for Google redirecting to Images (known issue) and perhaps to other Google services included in the Google Web Search page. Whatever, this is a work in progress, but for know it remains slow, very slow. Note, this interferes with any proxy plug-ins you may have installed like MediaHunt or others in Google Chrome.